Razer has become much more than a gaming peripheral company. 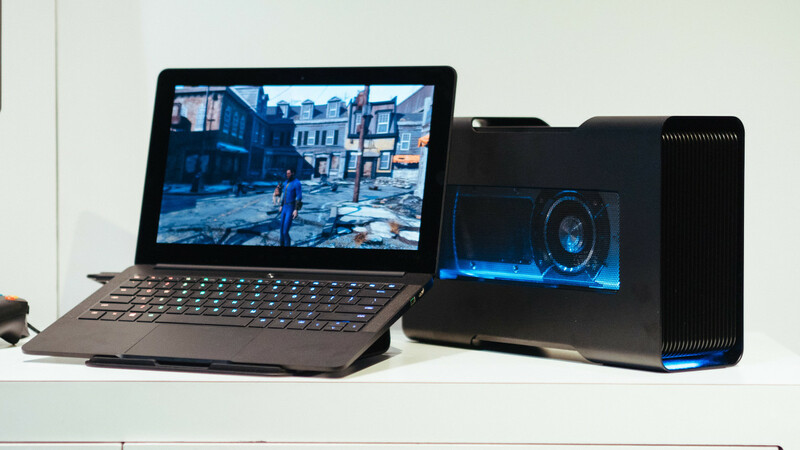 Its recent Blade line of laptops have been the subject of a fair amount of critical acclaim, and the latest entry – the Blade Stealth – is going to make a lot of gaming dreams come true. Unveiled at CES, the 12.5-inch laptop weighs 2.75 pounds, starts at $999, and purports to handle all your gaming needs. Well, kind of; you’ll need the additional Razer Core graphics dock (currently unpriced), which can power virtually any desktop-class video card through the Stealth’s Thunderbolt 3 port (a higher-end version of USB-C). That might seem like something of a cheat, and Razer isn’t the first to try this, but it’s by far the most sensible implementation for adding upgradeable external graphics to a laptop I’ve seen yet. Alienware’s laptops are still much bulkier than what we’ve come to expect from mainstream laptops, while MSI’s solution is less elegant. Both require you to restart your computer to use the desktop card too. The Blade Stealth is a fair bit lighter and smaller than my Surface Book. Meanwhile, the single Thunderbolt 3 connector is able to power the graphics card, gigabit Ethernet and four standard USB 3.0 ports. It’s dead-simple to replace the graphics card too; just turn and pull a handle on the back of the device to slide it out. The back of the Razer Core graphics dock. But even if you don’t need the gaming dock – which can be used on any device with a Thunderbolt 3 port, by the way – Razer presents a seriously compelling device. The base $999 price configuration gets you a 2560 x 1440 touchscreen, 8 GB of RAM, 128 GB of PCIe storage and a Skylake Core i7 powered by Intel’s HD 520 graphics. It’s quite possibly the only time I’ve seen an ultrabook with base specs I’d be happy with, comparing more than favorably with anything else on the market right now. Razer is also claiming eight hours of battery life on this configuration, which is less than many ultrabooks, but reasonable if it pans out in the real world. Razer’s Chroma lighting tech lets all of the keys light up any color individually, and react to a variety of actions. But shell out some more, and you can get a 4K screen with 100 percent of the Adobe RGB color gamut and 512 GB of storage ($1,600 for the top config). The only real qualms are that it can’t currently be configured with 16 GB of RAM, and the 4K screen will reduce battery life to six hours. Razer hasn’t cut any corners on the build either. It has a sleek, all metal construction with a soft, matte black finish. If Razer’s logo weren’t so gamer-gaudy, I’d say the Stealth is more understated than the 13-inch Macbook Air it’s competing against. The keyboard certainly isn’t understated though, as it can light up virtually any color and react to your typing and gaming actions. It’s a pleasure to type on too, if a little shallow on travel, and the trackpad felt both smooth and accurate. Meanwhile, both screen options looks great, especially the 4K model, although the bezels are a bit larger than I prefer. We’ll need more time with the device for final conclusions, but at first glance, I can’t help but be enamored; other than battery life, it’s spec for spec more powerful and more affordable than the equivalent MacBook Air. It’s hard to imagine Razer doesn’t have a winner on its hands. Read next: It'll cost HOW MUCH to have a smart and healthy 2016?